We all want to look special, but during winter time it’s pretty hard to be done, as we got used to layering ourselves in different layers. But today’s article is dedicated to ripped jeans and how to wear them in Winter. Jeans is a classic timeless piece that never goes out of style. It can be found in lots of great styles, starting from boyfriend to skinnies and flares. Anyway, I’ve got awesome outfit ideas with ripped jeans to share with you, all you need is to find the best look and give it a try this cold season. The ripped jeans are a great choice even for winter months not only for summer times. It’s pretty simple to wear them when it’s cold outside. How? This denim ideally fits all kind of layering combos, from shirts to sweaters and coats. 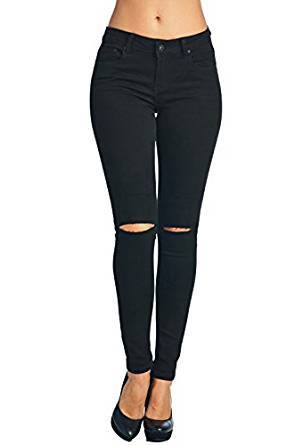 Speaking of holes, rips, and tears, then you can either cover most of them with a long coat, either go for tights and wear them underneath your favorite denim. 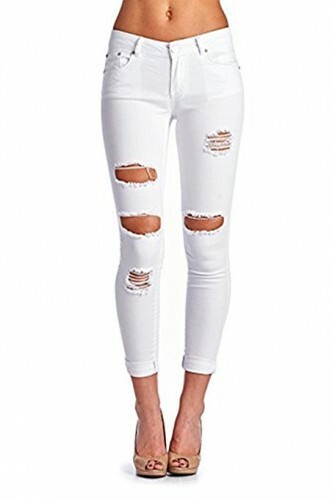 Ripped jeans can be found in different styles, from boyfriends, skinnies to slim-fit and mom jeans. Sure, the easiest way is to try on jeans with just small holes or with gaping holes on the knees, but there will always be women who go crazy about all ripped denim and try to make a real statement with jeans that have bigger holes. I am a big fan of slim-fit jeans with ripped knees that look pretty chic with oversized sweaters and ladylike heeled pumps. Jeans and knitwear is always a good combination. There are many possible ways how to style ripped jeans in Winter, but I highly recommend to wear tights underneath that match your skin tone, this is the safest way to make things look and feel right. Every woman who loves diversity has certainly got a pair of broken jeans in her wardrobe. Because they are very stylish, original and comfortable, they give you an air of chic look. If you do not know how to wear them and what to match them, follow the tips below. 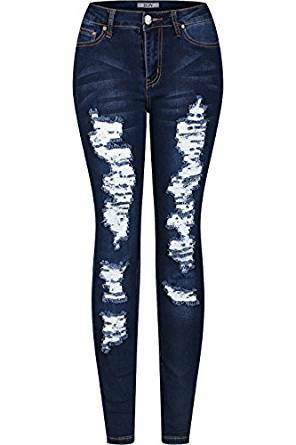 The ruffled jeans are a clothing detail for all silhouette types. It is important that when you dress them, you know how to match them so that you can hide the defects and highlight your qualities. – Girls with thick thighs are recommended straight cut jeans. Try to choose a model with fewer holes in vertical direction. This will make you look taller. – Weak girls can choose any pattern of broken jeans. But they will look best in skinny jeans with some cuts around the thighs and knees. 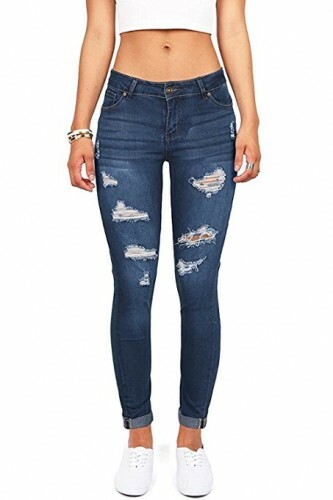 – Low girls need to avoid cuts and holes in the bottom of the jeans, they give a look distorted to the silhouette. If you want to add a little bit of color to your picture, choose the bright-colored jeans. You can choose neon or even acidic colors. The rest of the garment must have a neutral, pastel shade to create a balance of look. You must know that the extravagance of ruffled jeans is to make smoky feet, so it is recommended to wear them on the naked foot.